It’s been a while since my last review, hasn’t it? If you’ve been keeping up with my site, you’ll have noticed I’ve played Animal Crossing: Happy Home Designer a lot–over 45 hours already and still wanting to play so much more with many goals in mind. One question I often get asked about it though is “Is the game worth it?” “Would I like it?” “Do I need these things to play?” “Is there a town? And so I want to answer several of these questions in this review along with stating my own feelings on the game. 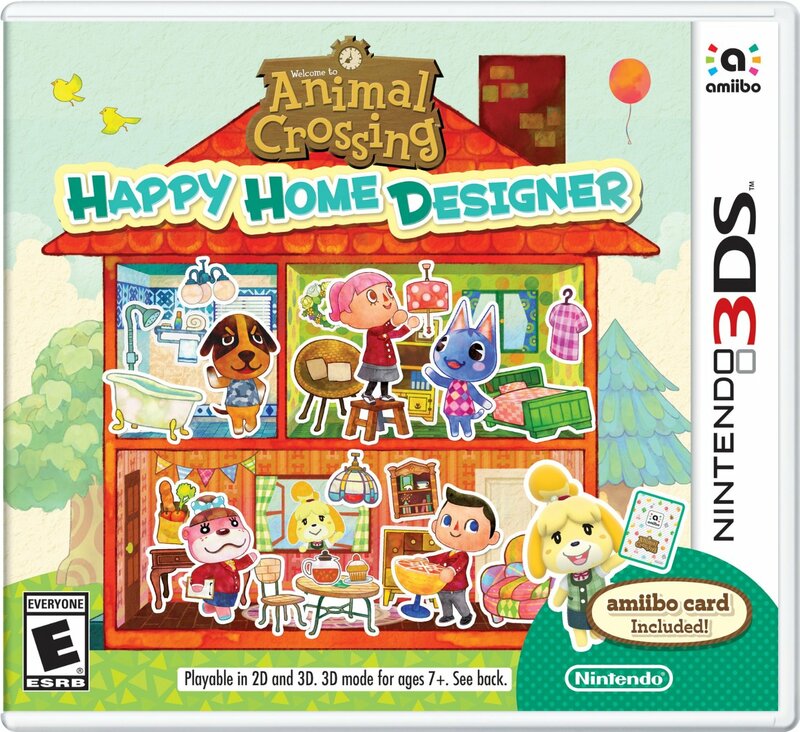 I will state right now though, Happy Home Designer is not for everyone. I will also state that I have been enjoying the games just as much, if not more, than the main series. But yes, I think I’ve rambled enough with this introduction, so I’ll go ahead and get started with the review itself. Animal Crossing: Happy Home Designer focuses solely on the home decorating of the main games. While there is some “exterior” decorating as well, it’s limited to home appearances (similar to how you’d pick them in New Leaf, though, with many new styles as well), exteriors of facilities you can design (we’ll get to those), and the yards of the Villagers you move in. If designing has not been something you enjoyed (or even if the only designing has really been fully making over your town, this could go either way for you) in the Animal Crossing games, it is very unlikely you will enjoy Happy Home Designer. The game isn’t real time though, so if you’re looking for something more relaxing, that’s another reason to consider the game. Even though the focus is on decorating houses for Villagers, that isn’t the only thing you do. Besides some of the exterior decorating (and even getting to pick the plots for them) for the Villagers, you also get to build up a “New town” as well. Despite it being referred to as a new town though, it’s much more of a main street. 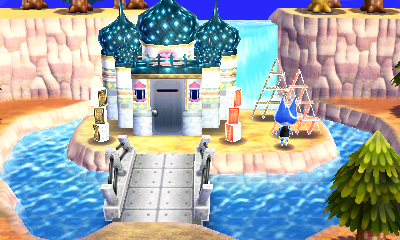 You don’t get to pick a map or design it full of paths and patterns, but rather the customization comes in picking a few different Exteriors for the various buildings and following the theme Isabelle gives you for that facility. That doesn’t mean you can’t be original in your own way–for example, the very first facility you make is a school. You could make a traditional school, you could make a magic school, you could make a very old-fashioned school, you could make a Sports school, a science school, etc. I do wish there were more options for the Exteriors though. I think it would have been really nice if we could have picked from a selection of colors/parts similar to the Exterior rather than selection of pre-sets. Going back to the interior decorating of the game, there are quite a bit of new furniture items in the game including two whole new categories–“carpets” and “ceiling”. Now, I know what you’re thinking with the first one–“don’t we already have flooring?” And yes, we do! But now there are both floors and carpets which can be combined into new combinations (along with even doing multiple rugs). Rugs can be done in Small, Medium, or Large sizes. That said, I do have mixed feelings on the rug/flooring split–several items that I am used to as Flooring have now been moved to Carpet and while some make sense (Such as the Princess Carpet), things like the Lovely Carpet which were full-sized can be a bit frustrating–especially if you want to layer certain carpets on top of them. I feel like the biggest issues with it could have been fixed if you had the option to have any flooring/carpet cover the whole floor or be a rug [in one of the three sizes] while also letting rugs overlap. As for the other category, yes, we can finally place items on the ceiling! 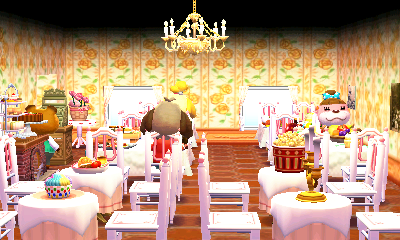 Chandeliers are some of my favorite things in real life so actually being able to use them in Animal Crossing now makes me so happy. The ceiling items are really nice and while I’m sad there aren’t more of them (or maybe I just haven’t been lucky enough to unlock more yet), it’s just… such a nice addition, honestly. Besides just new items though, many previously established items can be used in new ways such as the Public Works. You can use them outside Villager’s homes or even in their houses or facilities. You can also use patterns in rooms and outside as “rugs/tiles”, all previous options from New Leaf (refurbishing does return), and even for the roof of a house. Of course, you will not be able to use patterns, QR codes, and ceiling items right away. They are all part of the Happy Home Handbook which you’ll eventually unlock as you play the game. More or less, you use play coins to unlock new features. You are allowed to learn Ceiling items for free from the handbook, but the rest will cost anywhere from 1-5 Play coins to learn. Unfortunately, you can only learn one per in-game day. Some of the other great features you can earn though are the ability to change the appearance of the Windows and Doors inside, set ambiance sounds over just the usual K.K. Slider music, be able to get more house layouts for Villager’s homes, and change your character at anytime. One of the really neat things about the game is you actually get to choose your physical appearance from the get-go. Skin Color, Hair Color, Eye Color, Hair Style, Eye/Face style, and Gender–all selected by you, no vague random questions required. As much as I loved those, being able to choose how you look right off the bat is great–especially for those who preferred a darker skin tone and didn’t want to deal with tanning on the beach (or the fact that it was completely temporary). 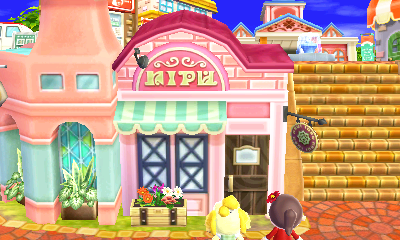 While you are required to wear the Happy Home Uniform top whenever you are working, you can still change your bottoms, shoes, face/head accessory and/or hat at anytime. While using a Special Villager Amiibo Card is the only way to be able to do houses for those characters. For the most part, the only special items they unlock are their photos (and not always–I’ve gotten a few special villager’s photos from Normal Villagers), but sometimes they will come with other things such as Isabelle coming with her scooter from Mario Kart 8. Overall though, the Amiibo unlocks aren’t really game-winning–even the challenges in the game only have prizes for participating so you aren’t missing out on anything if you don’t have (or want to get) any Amiibo to scan. All items are free once unlocked and you can use them to your heart’s content…within the item limit, of course. 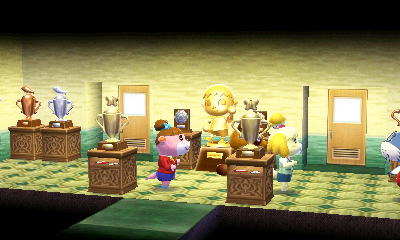 The item limit has thankfully been increased from New Leaf and while I rarely have hit it, there have been a few times I have managed to while working on Facilities and bigger rooms. Considering how much of a factor customization is in this game, it feels so weird to me to even have a limit. Especially as no matter what, there will only be so much someone can fit into a room as there are only so many spots on the floor, on items, on the ceiling, and on the walls. And while some limits can be understandable (Such as not being able to place a hanging item directly above a very tall item), stuff like “you can’t put more of this item down” just becomes very frustrating quite fast. Getting more into the negatives though, my absolute biggest issues with the game though are the fact that you can only do one thing a day and how to get bigger layouts for homes. The fact that you can do only one house or facility a day, while sort of frustrating to me (I’d really like the option to do everyone in the plaza that day for example–they do switch out and while some may be back the next day, there is no guarantee that they all will be), the bigger issue comes from the fact that if you go back and want to do any editing, it takes up the entire day and you’ll need to go back and save and all this dialogue (and possibly skip out on a villager you haven’t done a house for–this is part of why I decided to wait on editing for most things) if you choose to. I’ve gone into a facility and deleted one item when I realized it blocked something from working properly and lost an entire day of new homes. It’s just weird and not really needed. I think the option to have someone end a day sooner would be great, but I feel if there is stuff someone could still do, they should be able to choose when they want the day to end. As for the other issue, while yes, you do unlock layouts through the Happy Home Handbook lessons, it unfortunately only unlocks the start. To get bigger layouts (especially bigger multi-room layouts), you have to repeatedly go back and forth to “remodel” that Villager’s house to get the bigger room option. And it will only be for that villager.. There are over 330 villagers in this game not even counting Special and DLC villagers–going back and forth is annoying enough, but add in the fact that you can only do one action a day and that just gets tiring. It should’ve been a second layout lesson similar to the second pattern lesson that becomes available to buy after purchasing the first one. I’m not entirely sure why it was decided to be done this way, but it’s something that I’m not sure I will ever find worth it enough to even do. For some smaller things, there is sadly no real multiplayer in the game. The closest you get is by being able to look up people’s designed homes and facilities on the Happy Home Network–you can look them up with codes or just search randomly by criteria. I think it’d have been nice to quickly be able to see friends’ designs to rate along with maybe even making it so if you visit a certain friend’s designed home, you can talk to that Villager to have them show up the next day in your town. It’d be a great way to give another option besides Amiibo cards and also let people have a way to get any DLC characters they may miss. You also can never decorate a house for yourself. The facilities are as close as you get to “yours” and despite going “home” every day, you never see or decorate it which is just… such a missed opportunity, in my opinion. Finally, the organization in the game is awful. I’ve done over 85 houses now and I still have such a horrible time finding items. Not all chairs are under chairs, not all lights are under lights, some toys and things are in multiple places… With so many items in the game, it gets super hard to keep track and I often find myself having to go through everything or just use the search. And with the way things work as I mentioned in my first big issue, it is incredibly frustrating when you find something you forgot you had and/or something you think will be perfect after seeing it and have to waste another day to fix it. But yes, in short: If you love designing in Animal Crossing, definitely pick up the game. If you’re still unsure, maybe look up some videos or watch some streams. Seeing what you can do in the game can help a lot. And if you just love the kind of environment AC has, but with a more relaxed setting (No worries of villagers moving out or moving in and ruining your town or even missing events), you could also find a lot of enjoyment in this game. 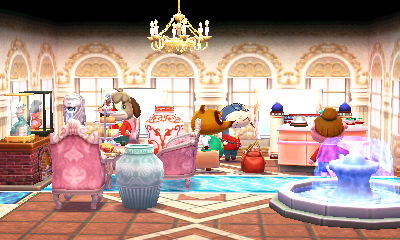 As much as I miss the museum, the relaxing pace and no longer feeling a sense of dread due to villager worries from past games is such a nice sigh of relief and while I have mixed feelings on certain things in the game and especially miss the museum, I don’t think I’d be able to enjoy a new main Animal Crossing game without several of the features from Happy Home Designer returning.